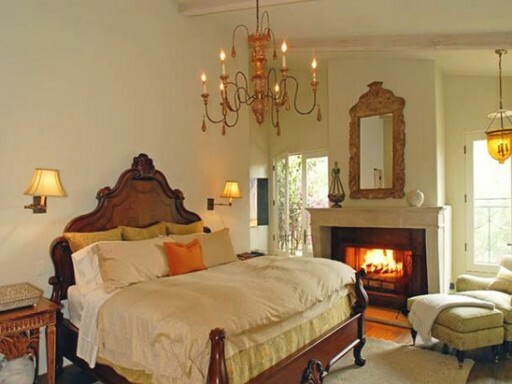 Oscar-winning actress Halle Berry (shown here with Gabriel Aubry, her French-Canadian boyfriend and the father of her daughter Nahla) bought this Mediterranean-style home in Beverly Hills for $2.275 million back in 2001. 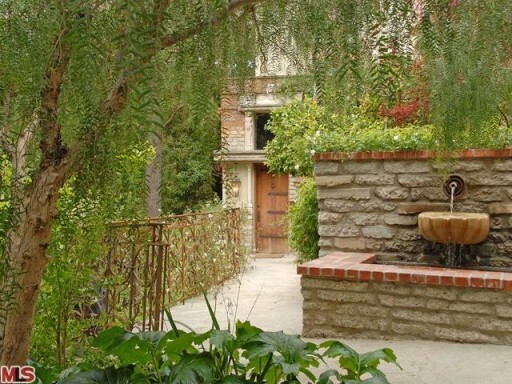 It’s small by Hollywood standards–only 2 bedrooms and 2 baths–but I can definitely see why it appealed to her. The home sits on a lovely and secluded 1.3 acres and looks like a sweet little hideaway to me. The house is currently on the market for $5 million. Rumor has it that Halle Berry’s mother has been living here recently. One-of-a-kind rustic & private Old-World Mediterranean graced by magnificent gardens, fountains, al fresco dining & seating areas, fire pit and sumptuous stone spa in a verdant canyon setting. The vibe is majestic, yet casual with vaulted heavy wood-beamed ceilings, wide-planked wood floors, detailed custom-made ironwork, stone-carved fireplaces, a dramatic staircase, banks of French doors/windows & a master suite tub carved out of stone. Cook’s kitchen. 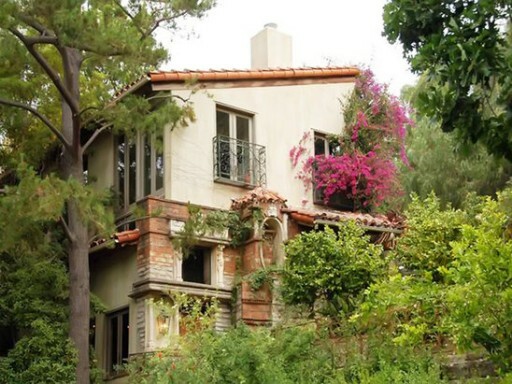 If you buy this house, then actress Amy Adams might be your neighbor. She reportedly purchased a renovated ranch down the street. More photos and information at The Real Estalker. 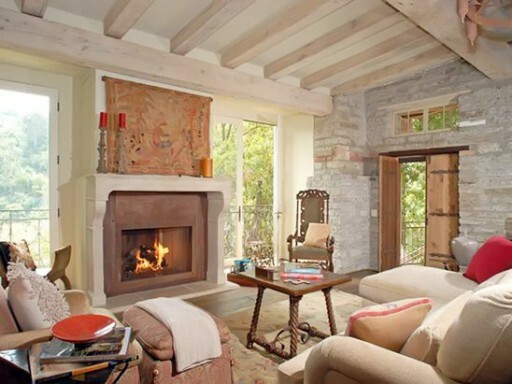 Visit Celebrity Houses to see more, from Christie Brinkley to Whoopi Goldberg. Hi Julia, Well, the staircase is lovely, and it is unique, but not my cup-o-tea. The ranch house in the neighborhood that was linked to this post was wonderful though. .-= black eyed susans kitchen´s last blog ..SHOWERS OF LOVE FOR THE BRIDE TO BE : A FAMILY PHOTO ALBUM =-. Oh Julia, I love this house and I could definitely live there…LOL! Don’t think it’s quite in my price range though! It is so different than the norm for a Hollywood star. Thanks for showing it. .-= LeAnn´s last blog ..A hint of black =-. .-= Marija´s last blog ..I’m Marija. This is my blog. =-. I laughed out loud when you commented on the throws. I was thinking, “hmmmm, that looks like the exact same throw in each pic,” and then you spoke my thoughts :). It’s gorgeous and I would gladly take it if I had an extra 5 mil to blow. .-= Beth@The Stories of A2Z´s last blog ..Deals on Pictures and Ask Me Anything =-. Thank you for sharing this lovely house. Houses like this make me happy! .-= Kristin´s last blog ..French shopping =-. I’ll take it, but you have to throw in Gabriel. What a unique home, I love it. I really like this house. I can see why it might be a little small now with no nursery for her daughter but definitely a cute house. Actually, I loved the kitchen. We might think it is small since we actually cook for our families, but in Hollywood I don’t hear of that many stars who actually eat at home anyway so anyone interested would go in and see the beautiful counter tops and top of the line stainless appliances and would be very pleased. I’m glad to see that, even though at the time she bought this she could very well have afforded a huge mansion, she opted for a really pretty and cozy home. 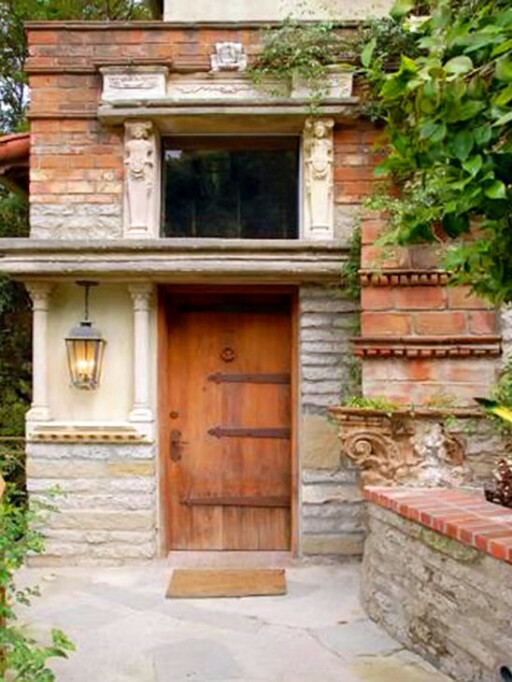 I LOVE this house, though it may be better suited to a single or a couple….but still…I would take it in a hearbeat! Love that view off the balcony! .-= Lou Cinda´s last blog ..Happy Met Monday and Make It For Monday =-. I think you’re right–looks like the same throw in those pics. I love your blog. I’m fascinated with spaces and how people use them. Thanks for sharing your eye on these amazing structures! What a cozy home! I love those pictures! .-= Sunshine´s last blog ..A time to be Grateful =-. Oh, I love this house. I like smaller, cozy houses. Looks like a happy house. .-= Amy´s last blog ..The End =-. Love the house.. need a bigger kitchen..but I love it..She is just lovely. .-= Monique´s last blog ..Oh My Goodness~ =-. What a beautiful home! I love that it’s small and secluded. That white throw definitely makes the rounds in the photos! I would’ve thought the kitchen would have been more open, but it’s functional. .-= Christine´s last blog ..$2.50!!!! =-. loved the vibe this house gave off! .-= anna see´s last blog ..Please Take Me Home, Country Roads =-. It’s an absolustely beautiful home–I could very easily live there. And I do love the front door as well. Maybe I could do that on my house! Very, very pretty. It would be perfect for moi!! I love the old world charm, and the light streaming in! 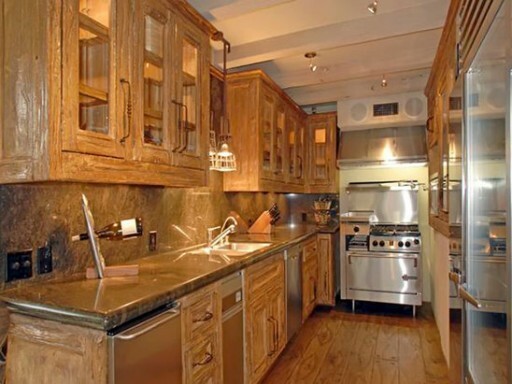 I absolutely LOVE that house and could even handle the narrow kitchen! The front door, huge entry window and stone/brick surround, fireplace in master and that light fixture- OMG so much to love. The crystal chandie in the bathroom and that tub- wow. .-= Morning T´s last blog ..Heard it through the grapevine =-. I am kind of in shock – that house is like my dream and I am not even kidding. Everything about it I LOVE LOVE LOVE! That has just sent me straight into the depths of my imagination. .-= Jocelyn Stott´s last blog ..Conversations With The Government =-. Not my style, but it does have character. The kitchen doesn’t seem to “go” with the rest of the house though. I love that last pic of them as a family. They are all so pretty! .-= Jenny´s last blog ..I Miss You, Ditto =-. .-= the BLAH BLAH BLAHger´s last blog ..Front Loader Problem and Solution! =-. So pretty! I could so move right in!! .-= melissa´s last blog ..Onward & Upward =-. I love, love, love the little balcony off the master bedroom! It’s a beautiful home. I like it better than the giant ones that seem like you would need a GPS to find your kids. .-= Kim @ Everything Etsy´s last blog ..Oops! Button Problems – Get Your Fix! =-. Such a sweet house. I love it!! It’s a little to small for my crew though. I like how open to the outside it is. I crave outdoor space with trees and growing things. .-= Rachel´s last blog ..Yeah Right =-. 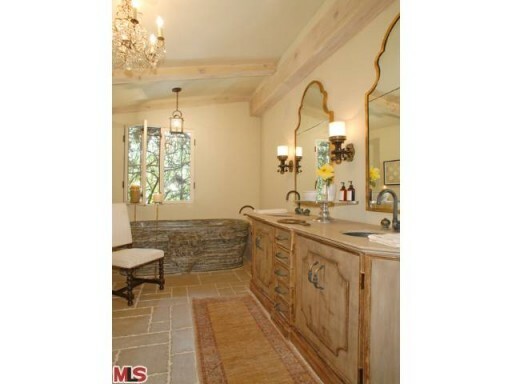 This is lovely except for the bathroom. It’s hideous and I’d redo it completely five minutes after moving in. I like the kitchen…but PLEASE get rid of the stainless steel 🙂 Small kitchens are easier to cook in, so I think it’s just the right size. 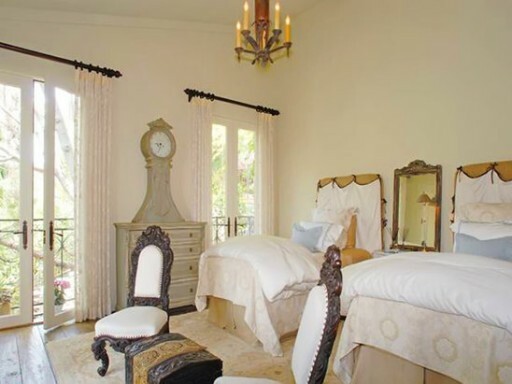 I don’t usually like celebrity homes, but this one has sure got my covetous juices going! Oh for $5 million extra dollars just kicking around! .-= Lori-Anne´s last blog ..Pick a Card =-. This house is absolutely lovely…i am love with the front door and the kitchen. .-= Stephanie´s last blog ..Geezees Census, Who are you people? And a bit about me =-. .-= Lisa´s last blog ..Cute as a button =-. So cute! And that house is just gorgeous! But my it’s expensive! Fabulous post Julia! .-= christy´s last blog ..Sleepyhead =-. That is definitely a hideaway. Gorgeous. 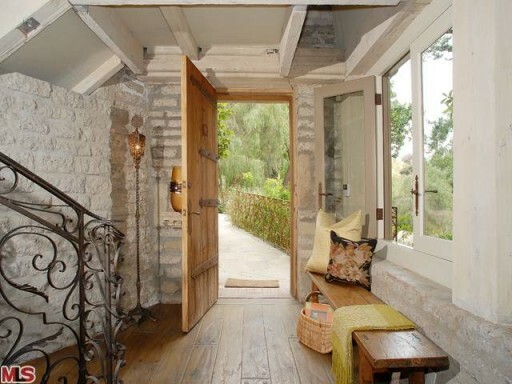 I love the stone walls in the entryway. .-= Jessica at Lavender and Lilies´s last blog ..Randomness & Kate =-. .-= Amanda @ Serenity Now´s last blog ..Checklist… =-. Wow. This is so stunning. I would definitely furnish the place just a little differently but the house itself is fantastic. I’ll take it! .-= Lesley @ TheDesignFile´s last blog ..Etsy pick: Chic baby bedding to dress up a nursery =-. Halle’s house is adorable. It’s details are incredible. I checked out the house Amy Adams purchased. The inside is charming and has so many details. I would have never guessed it looked like that from the outside photo of the home. When I saw the front, I didn’t think the rest of the house was going to be all that nice, but I was wrong. It isn’t my style, but I like it. This house is really cozy and I could see myself curling up on the couch in the greatroom. I wouldn’t want to live here, but wouldn’t mind it being a vacation home. Well I love it! It isn’t “just” my style, but I so appreciate homes that are tastefully done, no matter what style it is! I loved the front door and floors in the entry … and lots of other things too! .-= Polly´s last blog ..Finishing the hem. =-. SOLD! Now if I could only scrounge up 5 million dollars. It’s just so peaceful and sweet. I loved it. I think it fit my ideal of what her house would look like too. .-= Becky @ Farmgirl Paints´s last blog ..Being on top:) =-. .-= Robin´s last blog ..One of these things is not like the other =-. oh yes, beautiful people, beautiful home, oh hum, what a life for some! .-= Annie@A View on Design´s last blog ..Large Luxury Home with views of Adelaide =-. Hi Julia just when I thought it can’t get any better You Did It Again thats it I have to win the lottery and move in my dreams…. 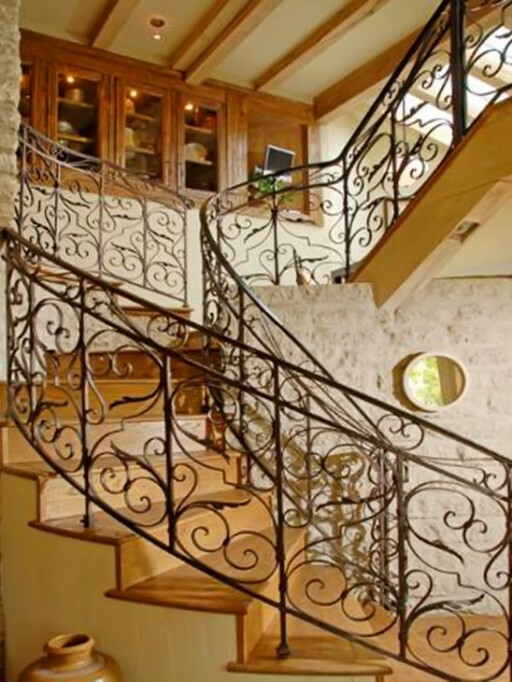 I love the stairway the kitchen the bathroom the everything (did I leave anything out?) Thank you Julia you made my day and I thought looking at the groundhog yesterday was fun anyway must go back to my daydreamin….. Regards Esther from Sydney…..
Just a fun FYI….When Halle Berry married David Justice of the Atlanta Braves my uncle married them in David’s home. He said that she is more beautiful in person than on tv or pictures. I knew that they were getting married before everyone else did. I wonder if I could have sold that to the tabloids? I’m joking. I wouldn’t have done that. My uncle wasn’t suppose to tell anyone. That was a long time ago but still a fun story. .-= Melanie´s last blog ..I’m swooning here =-. I adore this. I’ve been offline for a bit – blogoverwhelm – but I just had to reach out and say thank you for finding and showing us this one. It reminds me of my godmother’s house on a lush green mountain in Greece; same courtyards, wood, terracotta, light and details – even a kitchen that’s small at one end but has a table at the end out of camera shot. We helped her build it, from the foundations to the stone walls in the yard. I don’t do envy, but my goodness if I won the lottery, it would be very tempting to buy a dream home like this. It’s good to be back, Julia; your blog is one of those that feels like home. .-= janice´s last blog ..A Patchwork Post: Soup, Song and Hyacinths =-. Love it! Tooo cozy! I love the master bedroom. .-= Jess @ Frugal with a Flourish´s last blog ..Seeing Red … =-. The house looks pretty big for only having 2 br. Beautiful house! .-= Paula Grace´s last blog ..Thursday’s Room =-. Halle Berry’s house is so gorgeous I could cry. What a dream! 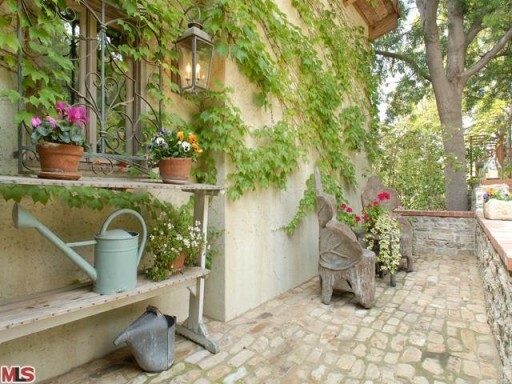 I love all the vines outside, like a fairytale cottage. She probably has a gardener………………. I’d love to wake up in that bedroom with the birds singing, swing open the window and see that view. Almost as pretty as New Jersey! Thanks for the fun, Julia and I love your new chest. Could your Mom adopt me? I had always been wondering if Halley Berry ever live in Canton, Ohio because I had family there long time ago, and also my father had lots of brothers which could had been her father. During an interview recently I heard Halley say that if she was not an actress she would be an Interior Designer. I wonder if she designed this home. I love it. Who says a house has to be a mega mansion to really enjoy it. I came from a family of 8 and we lived in a 1500 sq ft house with one bathroom. Somehow it worked. Times as certainly different now. In many ways I’m glad of that but I do miss the good old days at times. I LOVE this house! Exactly what I would want style wise. It looks a little incomplete as far as interior decor but the outside is gorgeous! LOVE EVERYTHING ABOUT THIS. WISH I COULD AFFORD IT!!!! This is by far my favorite celebrity house. I must convey my affection for your kindness in support of men who really need help on your concern. Your special dedication to passing the solution all around came to be incredibly functional and have consistently encouraged regular people much like me to achieve their pursuits. Your important suggestions signifies a great deal to me and somewhat more to my peers. Thank you; from everyone of us.